Blocktrades, Please Add Support for Bech32 Addresses! 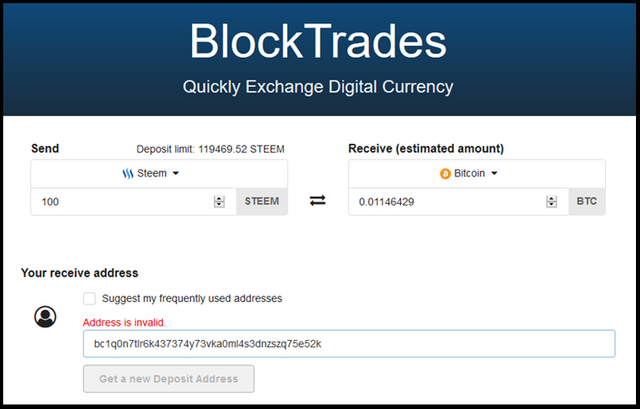 Something that's been pretty annoying for the past couple of months, is the fact that I can't use Bech32 addresses when I'm using Blocktrades to exchange Steem to Bitcoin or vice versa. Most other exchanges have slowly but surely added support of Bech32 Segwit addresses, but the only way to use a Segwit address on Blocktrades is to have a legacy p2sh-p2wpkh address. I'm using the open-source Electrum wallet to do most of my day-to-day transactions and it's currently not possible to easily create p2sh-p2wpkh addresses with it. When you create a new Segwit wallet, it automatically creates addresses in the bech32 format. Now, while it is possible to create p2sh-p2wpkh addresses with Electrum, doing so isn't recommended. You won't be able to use your wallet seed anymore to recover your wallet, instead you must manually save the wallet itself, which is a lot more cumbersome. I sincerely hope that you, @blocktrades, could add support for bech32 addresses in the future! I'm currently forced to use Bittrex, which is a lot more time-consuming and on lower value trades, it's a bit more expensive due to their 0.0005 BTC withdraw fee. We'll look into this, thanks for the heads up! Your UA account score is currently 4.123 which ranks you at #3300 across all Steem accounts. Your rank has improved 6 places in the last three days (old rank 3306). In our last Algorithmic Curation Round, consisting of 217 contributions, your post is ranked at #43.